Dementia is a devastating condition to watch a loved one go through. Our Jackson Memory Care services offer stimulation, activity, therapy, and dignity, but we always wish there was more we could do. Well, we’re excited about a new tool that is allowing us to reach residents with Alzheimer’s in fun, entertaining new ways. Best of all, it offers a lot for our Assisted Living residents as well. Regency concluded testing of this new computerized resource in two communities and recently added new units company-wide. We believe this tool, combined with the quality of our facilities and services delivered through the compassion of our caregivers, equip us to provide a high level of care while providing our residents with stimulating ways to improve their quality of life. What is it? No, it’s not just another PC connected to the Internet with some apps on it. “It’s Never 2 Late” (iN2L for short) is a portable touchscreen kiosk that can be used in a group setting or by individual residents, both for entertainment and for therapeutic uses. Why this system? Why now? Jeff Clay, Regency’s COO, reviewed several similar systems and concluded that iN2L offered the most for our residents. It will be an integral part of all of our Pathways INTENTIONAL Memory Care Neighborhoods going forward, he said. To get the optimal use for Memory Care residents, Regency staff are integrating videos by famed dementia care authority Teepa Snow on ways iN2L can be utilized. What can residents and families do with iN2L? Interactive music files that allow residents to sing along and “play” instruments. The recordings can be saved and shared with family. History and trivia quizzes, along with a host of games. Clips from old TV shows and commercials. 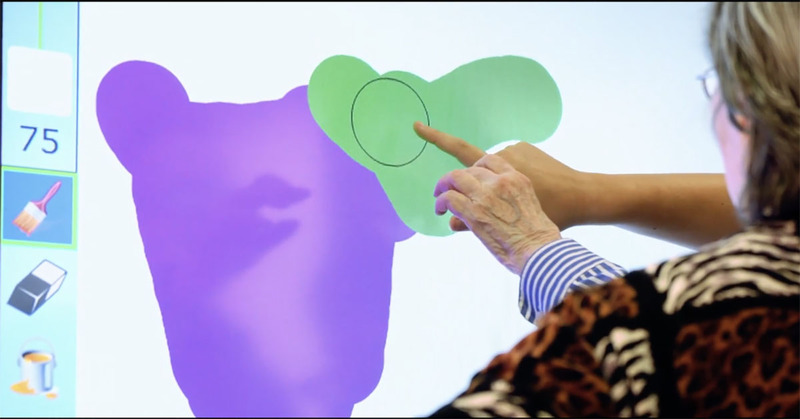 Puzzles that residents can work by touching the screen. A flight simulator, complete with joystick. A stationary bike connected to a program that enables residents to enjoy an onscreen scenic path while getting their exercise. A paint program to create artwork that can be saved and printed or emailed to a family member. Google Earth app for residents to view locations nearby or around the world. The ability to see what is happening around the world in real time via live stream video. Also, through iN2L’s Internet connection, Skype and email with family members can be set up, with pages customized for each resident. Studies have found benefits when residents of Assisted Living and Memory Care communities use the system, including large reductions in depression, increased cognitive activity, less need for medications to address problem behaviors and less frequent behavioral episodes. The system also improves morale for staff, who find it less stressful working with dementia therapy and actually enjoyable to watch a resident, for example, tap into emotions after hearing a familiar song they loved as a youth, or an Assisted Living resident learn new things. Answering trivia questions stimulates the brain, while using a touchscreen to “pop” virtual bubbles improves hand/eye coordination. Residents are too entertained to consider it to be therapy and look forward to their next opportunity to “play” with the system. Considering the difficult relationship that many seniors have with technology, it says a lot that they can use iN2L with minimal frustration. Communicating with family more often improves mood and decreases feelings of loneliness. We hope resources like iN2L equip us with more features that encourage Tennessee seniors to make Regency Jackson their new home. To set up a free consultation, call (731) 661-9888 or leave a message on our Contact Form. We look forward to sharing these exciting new experiences with our residents.